Corner of Vernon & Grove Streets, just north of Rt. 9, off Edgell Rd. Visit the Framingham History Center website at framinghamhistory.org for current exhibits, membership info or sign up form, or to contact the History Center staff. The Framingham History Center is a non-profit organization founded in 1888 for the purpose of preserving and understanding Framingham's rich and varied past. 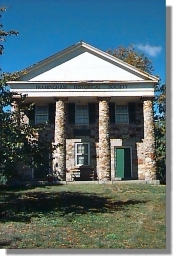 The society maintains its collections at The Old Academy building in Framingham Centre, located at the corner of Vernon and Grove Streets. Programs and special events are also offered throughout the year, featuring speakers and performances with historical themes. There are many Framingham-related items available from the Museum Store. Wed. - Sat. Noon to 4 p.m. Become a Member of the Framingham History Center! discounts at the museum gift shop.